Robert Walser jigged his way to victory during the Toyota Tundra Bassmaster Weekend Series, operated by American Bass Anglers, South Carolina Division 9 tournament, held March 9, 2013, on the Santee-Cooper Lakes. Running out of John C. Land III ramp near Summerton, to fish the 110,600-acre chain of lakes, the Lexington, N.C., angler caught five bass weighing 25.28 pounds for slightly more than a 5-pound average. For the Boater Division victory, Walser took home a check for $1,965. In second for the boaters, Ronnie L. McCoy of Lamar, S.C., brought in a five-bass tournament limit for 20.83 pounds. He anchored his bag with a 7.73-pounder and pocketed $983. Tim A. Jones of North Augusta, S.C., landed four bass going 20.63 pounds for a 5.16-pound average. He went home with a check for $655, but could have won much more. In fourth place for the boaters, Sean Anderson of Leesville, S.C., landed five keepers for 18.99 pounds with an 8-pound kicker. Andy Wicker of Pomaria, S.C., took fifth place with four bass at 18.08 pounds. Brad Fowler of Pendleton, S.C., followed in sixth place among the boaters with four bass and 16.41 pounds. However, he brought in the tournament lunker, an 8.77-pounder. He collected $360 for sixth place and an extra $185 for the bucketmouth. In the Co-Angler Division, Clyde Whiteside of Forrest City, N.C., won with three bass and 8.69 pounds. He earned $983 for the victory. Calvin Sharp of Round O, S.C., landed in second with two bass for 6.66 pounds. He won $491. Robert Gambrell of Cleveland, Ga., only found one keeper bass, but his 6.48-pounder took third place. It also earned Gambrell the division big bass award. 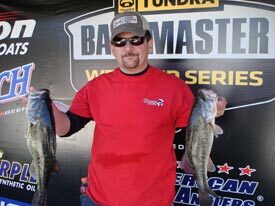 Jon Smoak of Sumter, S.C., placed fourth among the co-anglers with two bass going 6.46 pounds. 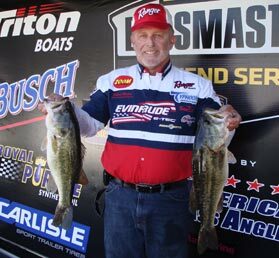 Vernie Haltiwanger of Lexington, S.C., rounded out the top five co-anglers with two bass and 5.42 pounds. For more information, call Billy Benedetti, tournament manager, at (256) 230-5632 or ABA at 256-232-0406. On line, see www.americanbassanglers.com.